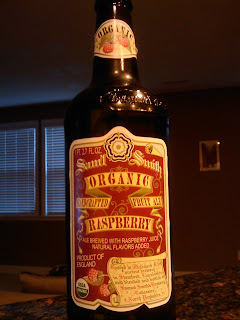 Next, I tried Samuel Smith Organic Raspberry fruit ale. This was a good beer, but like I said, I like fruity beer's. When poured into a frosty glass the red tint of the beer is very evident. I sniff of the top of the glass gives great hints of the raspberry which is present on the first taste. This beer was almost like a fruit drink instead of a beer. There isn't as much of a hint of raspberry as there is a hint of beer. I liked it a lot and I would like to try their cherry fruit ale as well. After the honey beer I tried the Baltika No. 4 Dark Lager. Definitely different from the sweet beer, this beer was a thick dark beer with a definite bitter taste. Not that it was bad, thats just the type of beer it is. 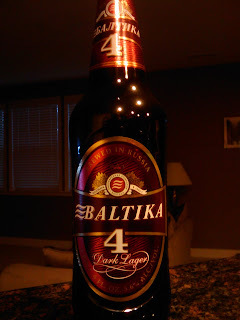 The Baltika website says it has a hint of bread and slight bitterness. I guess I didn't really think of the beer as tasting of bread, but I could taste the slight bitterness. It isn't that the beer isn't good, I guess in general I don't care for bitter beers, but it wasn't bad after you start. 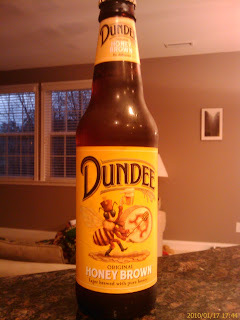 Two weeks ago (yea i'm not updating often enough) I tried the Dundee Honey Brown Lager. Infused with pure clover honey, this beer falls in line with my "sweet or fruity" beers that I like. I thought I could taste the honey just barely but thats probably the point, just a hint. It was a very drinkable beer and I would buy it again. Check out their website for info on the Honey Brown Lager. I really enjoy creating websites, so as I've learned new things I try to incorporate them into my websites. I have completely re-done the RTP Railfan website. It has a new layout and I think a better look to it. I'm still putting the final touches on it so some of the links probably aren't working but its pretty much there. Check it out.